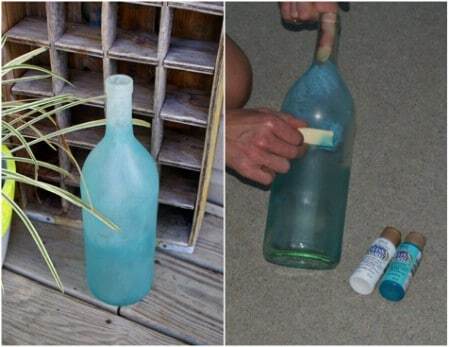 Home » Decorating » 26 Epic Empty Wine Bottle Projects – Don’t Throw them Out… Repurpose Instead! 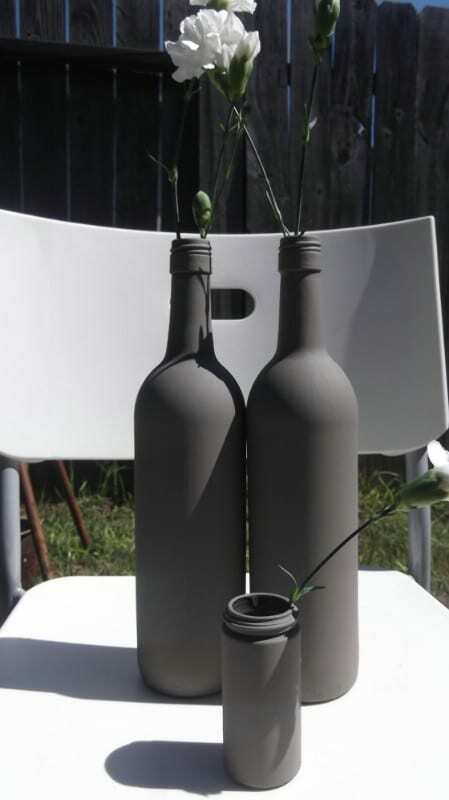 Wine bottles come in all different shapes, sizes and hues, and those diverse qualities make them such versatile objects when it comes to upcycling or repurposing. I was rather taken aback when I came to realize just how many interesting and creative ways one can use these empty bottles, be it for something functional or pure décor. The first step to any of these projects is to empty the bottle(s). It’s a tough job, I know, but someone has to do it. You can always try to round up some friends to help you through this tedious step… I’d recommend that you wait until the next day before you get crafting. 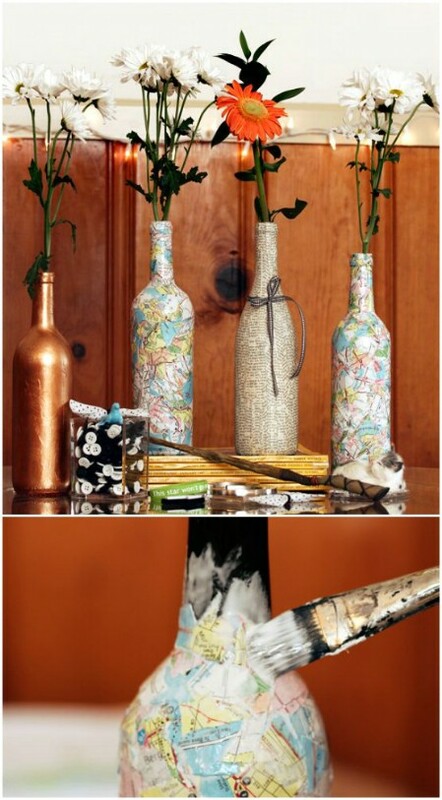 An empty wine bottle makes a great vase or decoration piece on its own, so here are some great tips for decorating the bottle itself. If you love getting in the holiday spirit then why not decorate your bottles accordingly? 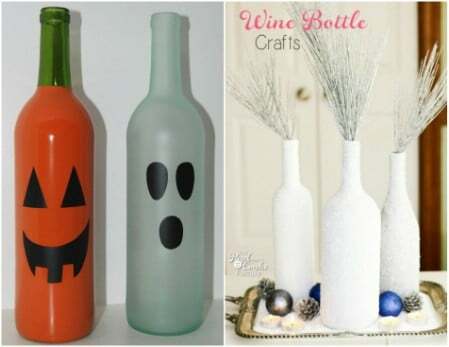 Show your excitement and appreciation for any and all your favorite holidays, from Halloween to Christmas, with a bit of wine bottle décor. Adding a bit of lace to the bottom of your bottle can make such a difference! And I just love the look of the dripping paint on the inside, too. This is actually a fantastic idea for a wedding table centerpiece of table number. Oh how I love stencils! When your hands are a little shaky (perhaps from all the wine…? ), or when you’re not feeling particularly creative or artsy, a great stencil can save the day (and your craft) by doing all the hard work for you. I love ombre, and I love frosted glass, so there’s really no reason that I shouldn’t combine the two! This look is relatively simple to achieve, and it looks so great on its own that it doesn’t even need any flowers or other fillings. Personally, I’m not much of a glitter fan, but I do like the idea of picking out my own nice ribbon with which to completely wrap a couple of empties. You can leave the bottles as is with your ribbon of choice, or add some lettering or any other kind of decoration, really. This is a very simple project, and just look how great it looks! I love the map idea, especially if you’re looking for a special gift for a globetrotting friend, but you could even use a wedding invitation, sheets of music from your favorite song, or anything with some special meaning. When it comes to etching, your possibilities are practically endless – draw a pattern or picture, use a stencil, write out a meaningful phrase or song lyric… whatever! Etching is such a simple technique to implement when you want to decorate glass. (or rope) is one of my favorite materials to use because I just love that raw, rustic, nautical charm that it brings. 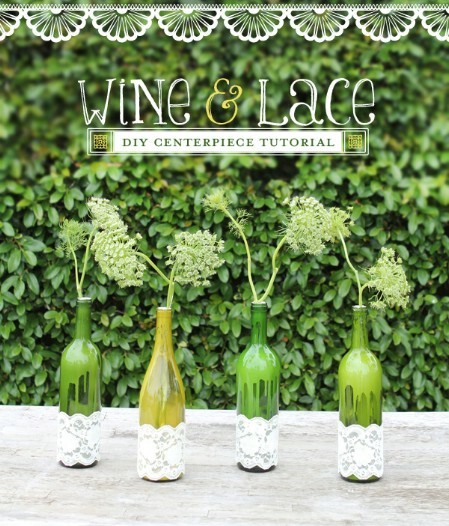 It really is as simple as wrapping your bottle with twine and adding some glue along the way. You can add little accent pieces like these rosettes, but I prefer the simplicity of the twine on its own. 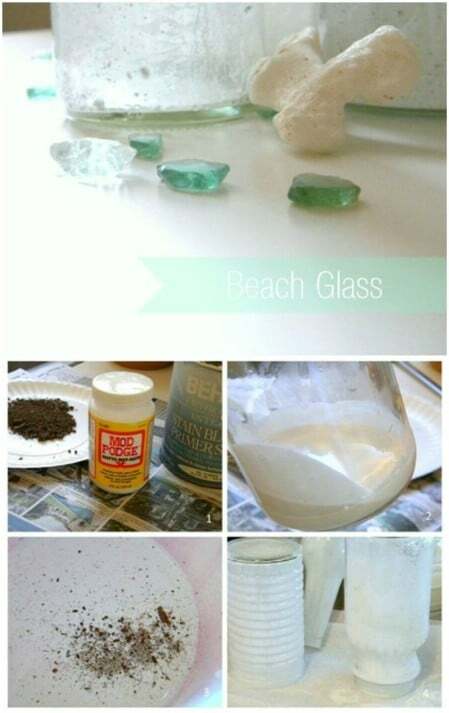 Have you ever picked up a small piece of frosty beach glass and wished you could get it on a bigger scale? Well, here’s how you can fake it with a clever use of Mod Podge, paint and some dirt. Perfect for any beach home! A good coat of chalk paint can totally transform your bottle from looking like glass, to looking as if it were made from clay or even cement. I just love the sleek, modern look, and what I love even more is how easy it is to achieve this effect. 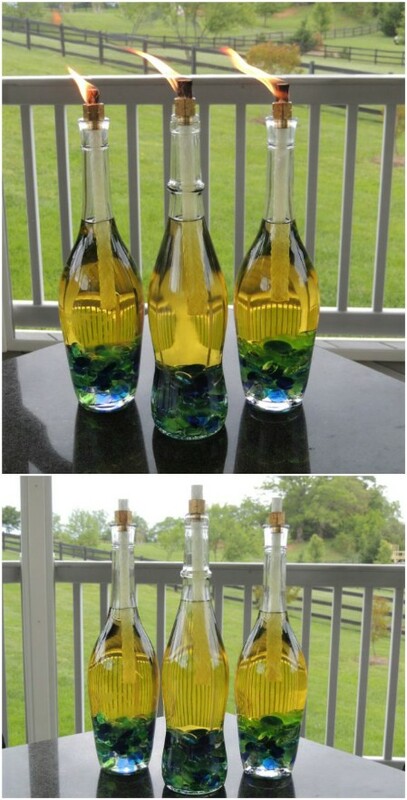 If you want to totally repurpose the bottle and turn it into something completely different, then these are the projects for you. 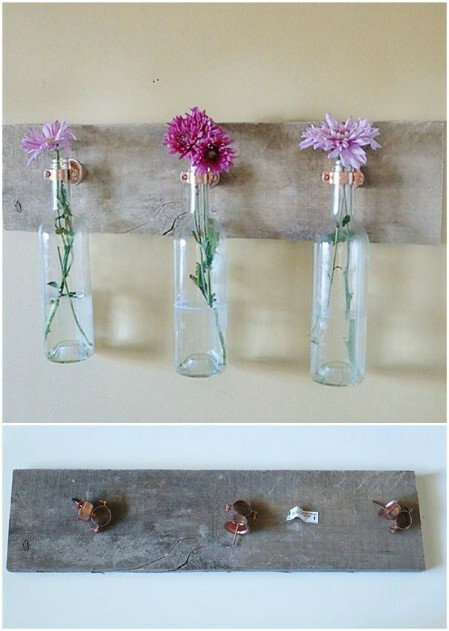 At Organize Your Stuff Now, we found this adorable repurpose idea for glass bottles. 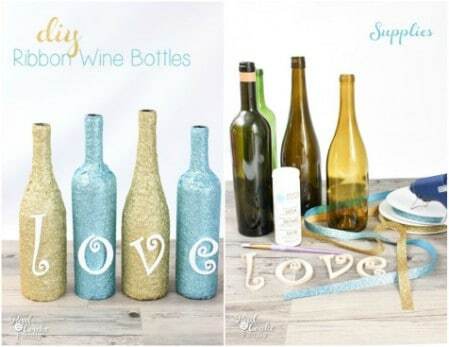 With just a bit of glue and glitter, you can create these lovely bottles that are perfect for vases or any decoration that you want. You can use them as centerpiece vases for reception tables for a wedding or any other special event. They are easy and relatively inexpensive. 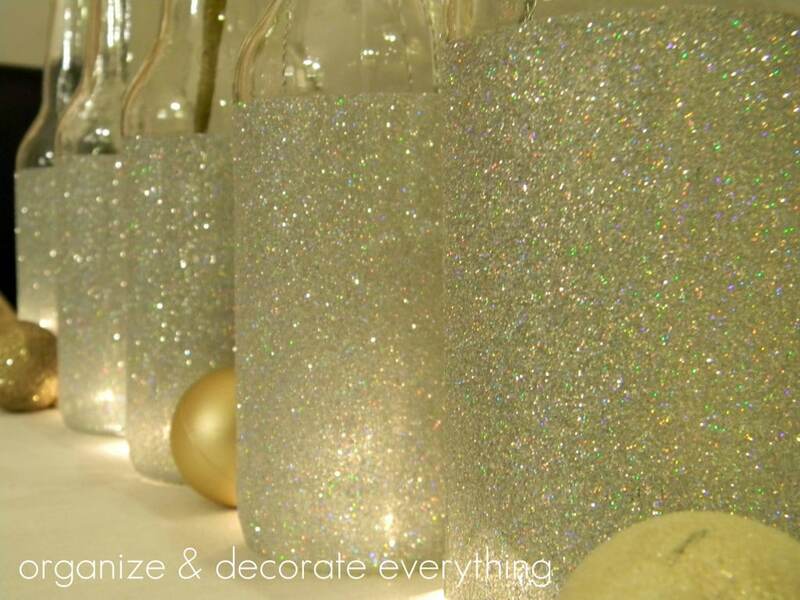 You just have to have a few glass bottles on hand and then purchase the glue and glitter. 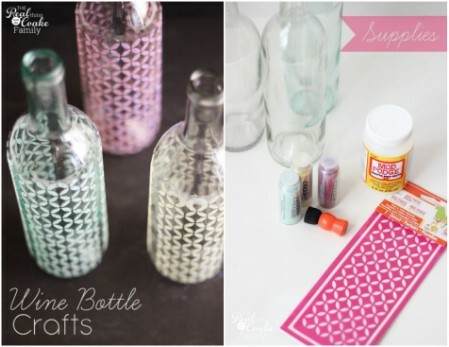 You can use electrical tape to mark off areas of the bottles that you don’t want to glitter and make your own patterns. 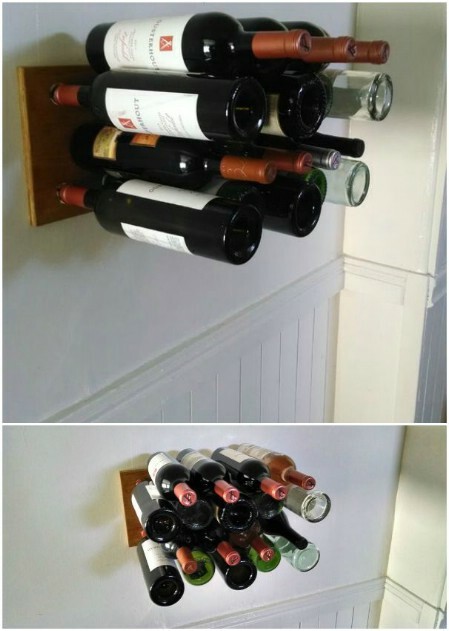 If you’re looking for an interesting bookshelf, then look no further than your wine bottles (and a few planks of wood). There’s no real step-by-step tutorial for this project, but it shouldn’t be too difficult to figure out based on the photos. This project will definitely take a bit more work than the others, but anything good is worth working for, right? What an innovative way to get some privacy and create an absolutely stunning piece of recycled art! 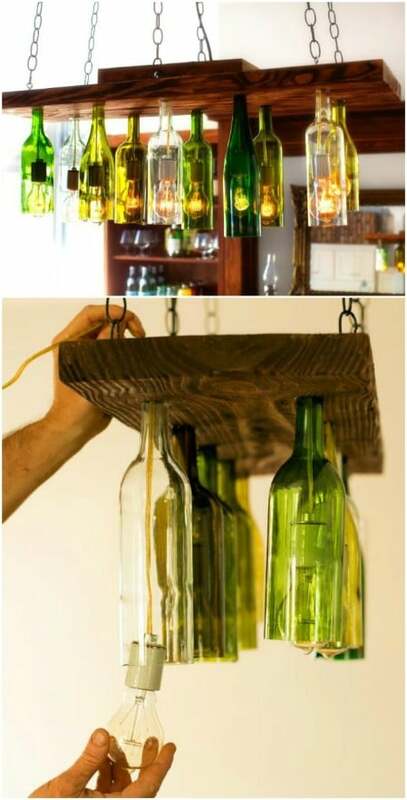 Regardless of whether it’s cheery springtime or dreary wintertime, a hanging vase trio made from upcycled wine bottles and reclaimed wood will always add a touch of joy and optimism to any home. That sleek and elegant shape of a wine glass really makes it the perfect shape for a pendant light, don’t you think? The color selection is all up to you, of course, but the more I look at theses, the more I fall in love with the colorful retro look. 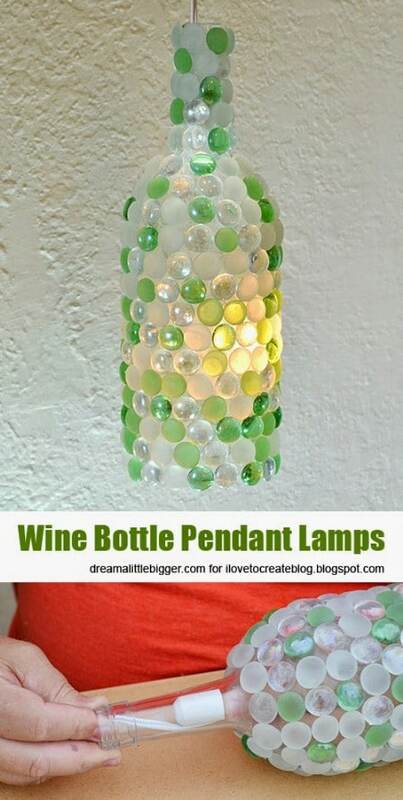 If you want to make just one eye-catching pendant light, then consider gluing some glass pebbles to the outside of your bottle. Just think of the gorgeous colors and patterns that’ll be displayed when you switch the light on in a dark room. This project nearly caused my jaw to hit the floor once I figured out how it actually works. 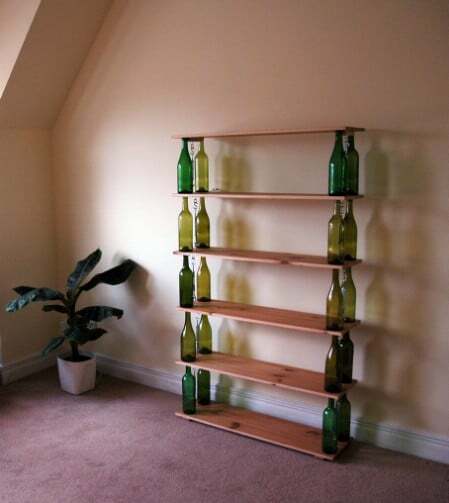 The empty bottles act as the shelves on which you rest your full bottles, so it actually just looks as if all your bottles are floating neatly against the wall. Genius! In my opinion, it’s the little things that make a home cozy – all those small touches add up. 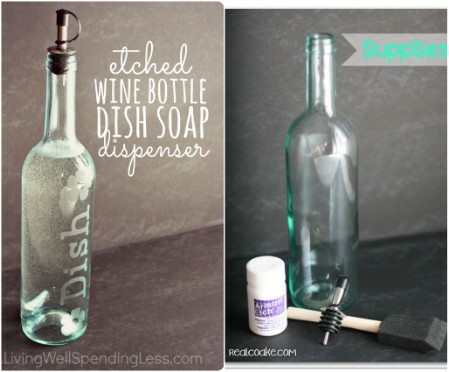 So, with that in mind, I found this cute project that turns a wine bottle into a soap dispenser (you could also use the same concept to store your olive oil or vinegar). It’s nothing fancy, but it looks great! 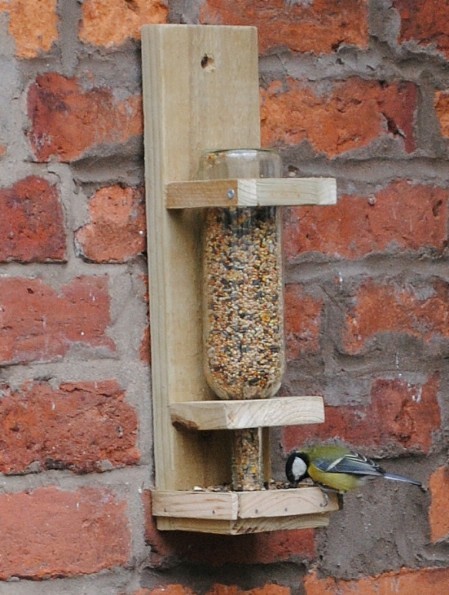 If you want the cheery, chirping birds to keep coming back, then go ahead and lure them with this clever birdfeeder. As one commentator points out, you should mount this somewhere that doesn’t get direct sun in order to avoid condensation and damp bird seed. 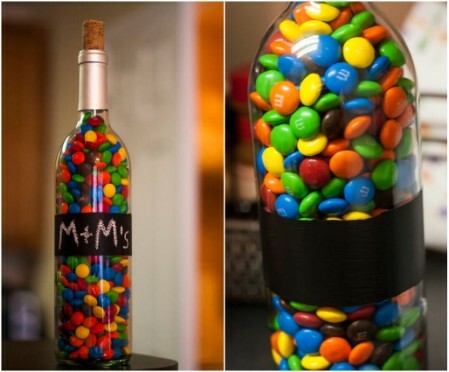 This isn’t exactly groundbreaking, but it is a clever idea: use your bottles as jars for small items like M&Ms, skittles, or even rice or beans. A stripe of chalkboard paint just makes it easy to change your labels depending on what you’re storing. Now this is a fine piece of furniture right here! 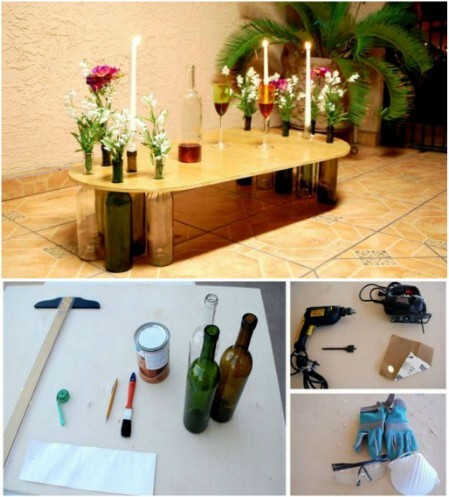 Wine bottles as table legs? Genius! And the necks that protrude upwards can be used as vases and candle holders so that your wine table always looks beautifully decorated. 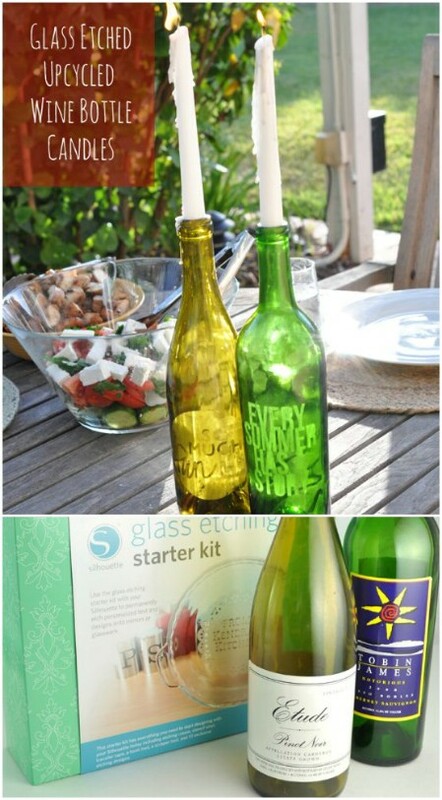 Get yourself a set of cheap string lights, drill a hole into a wine bottle, shove the lights in there, and voilà! A collection of these would look gorgeous on your mantelpiece, or as a centerpiece for a dinner party. Just be sure to use LED lights that don’t heat up. 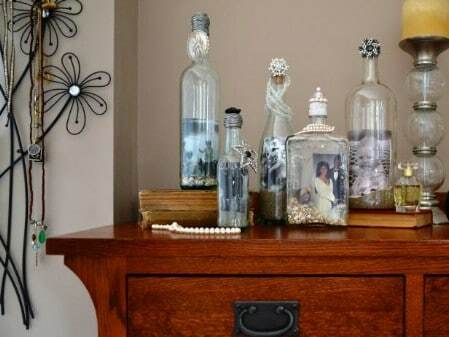 Placing your prized photos in bottles is such a creative way to display them, and you can even add your own little mementos to personalize it even further. There are so many other interesting ways to present your photos, so ditch the frames and try something different. Now this is the kind of project I’ve been looking for! If you like everything to be uniform and neat then you can use the same types of bottles, but I prefer the mix-and-match style of different shapes and colors. 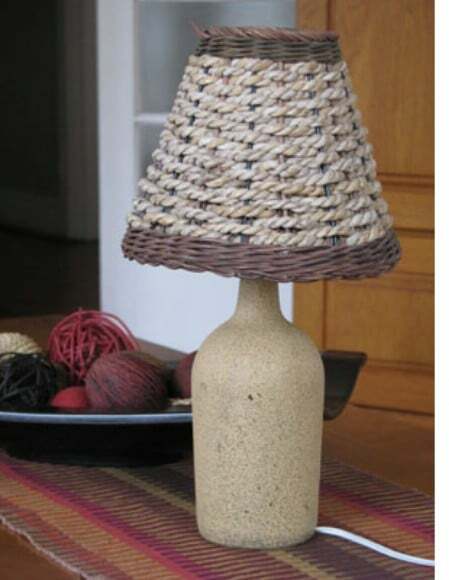 Wouldn’t these tiki torches look great outdoors when you’re enjoying a barbecue outdoors? You can even add some citronella (or get citronella fuel) to keep the mosquitoes at bay. No offense, but doing 99% of these would make anyone look like an alcoholic. The lamp one was pretty cute though. Lol, you can get empty bottles from a local winery. 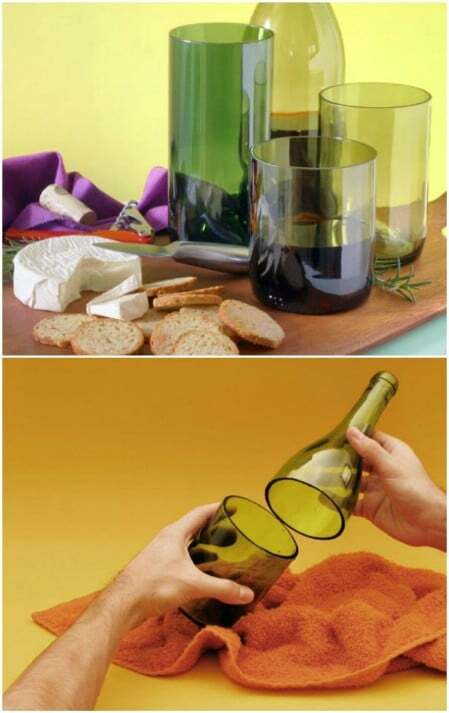 i find these ideas quite intriguing. i will be trying them all immediately! I am etching gallon wine bottles for Christmas presents and the ideas on this site have given me many more ideas! Thanks!